Chris Huber is bringing his expertise to Carson City. What Huber knows is the world of cycling. Huber is a former professional cyclist who had several top-10 finishes in the World Cycling Championships and held the speed record for a self-powered vehicle in 1993. Now, he is translating that success into a business. 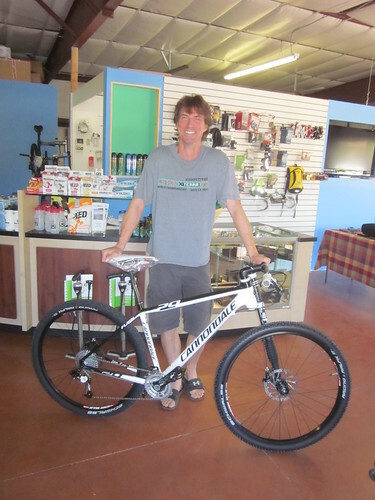 Huber opened his bicycle shop, Bike Carson-Tahoe, in August of last year. At first, he said, he was receiving a lot of repair requests from customers in the Hot Springs neighborhood. But after nearly a year in business, he said, his clientele has started to expand. It wasn’t quite what he expected. Growing up in the Bay area, Huber said, he was always on a bicycle. He rode his first century ride at the age of 12 or 13. While he took a break during high school, he picked it back up after graduation, getting into racing. He spent 16 years as a professional cyclist, riding six years for the top-tier Coors Light team. He retired from the sport in 1995. During his career, he said, he never experimented with performance-enhancing drugs but knew they were there. He said he set the goal to finish within the top 8 of his 2.5-mile Individual Pursuit, and let that be his motivation. After living 10 years in Hawaii, Huber moved to Carson City to be with his girlfriend, Janice Brod, whom he met at the X-terra World Championships in Maui. While he laments the cold winters here, he appreciates the open space for both mountain and road biking. He carries bikes that run from a $500 commuter around town to a $5,000 road or mountain bike. He carries Cannondale, Pivot, Ibis, Breezer and Surly mainly. By Christmas, he said, Cannondale will be releasing its line of children’s bikes. He also leads weekly rides from his shop and offers two annual bike tours in Hawaii. His experience with building his own bikes means he can fix just about anything, even a broken frame. “I can do things most people can’t,” he said. Despite his own expertise, he said, he’s happy to help those with less experience.